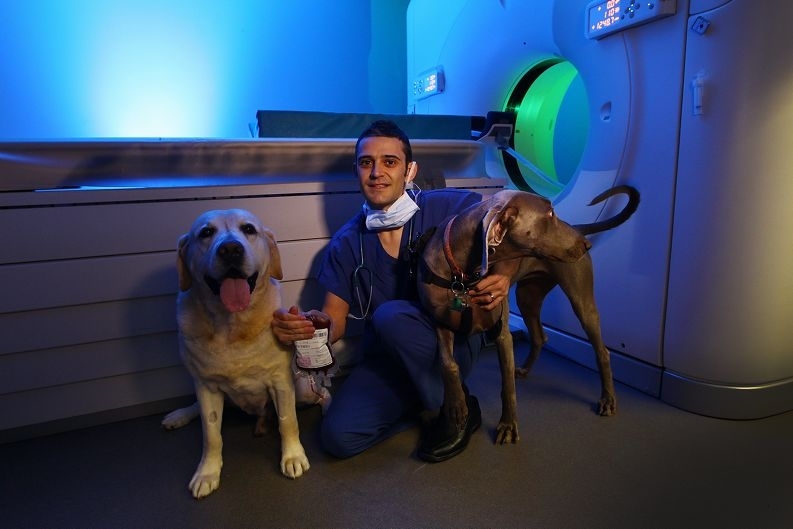 Neal O'Connor (Head Vet, PVS Emergency Care) with Floyd (12) the Labrador & Leah (2) Weimarama. Owner Cherie Baxter said the dog collapsed at her home because of a tumour on the organ. Floyd has been diagnosed with haemangiosarcoma ” an aggressive form of cancer. Perth Vet Specialists (PVS) Emergency Care, who treated Floyd, is desperately seeking blood from donor dogs in the western suburbs, where many of their patients reside. Traditionally, emergency practices have collected donations from racing greyhounds, set to be put down, for use in surgery. He said canine blood could be stored for about three weeks but a regular supply was needed. Blood can be taken from an animal every three months. Dr O’Connor said that as an incentive they were offering to provide free blood screenings and typing for dogs that donated. Ms Baxter said she would register any healthy dogs she owned in the future.